Fill out the following information to purchase a gift card for Superior Garden Center. Gift card will be mailed the next day. Please note that upon submission you will be redirected to PayPal to complete your order. 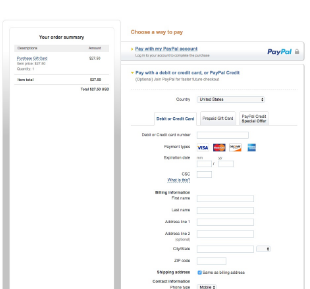 We use PayPal as a safe and easy way to accept credit cards in our order forms. PayPal keeps your financial information securely encrypted and doesn’t share it with sellers or merchants. A PayPal account is not required to make a purchase. When you click the submit button on our order forms, you will be redirected to the PayPal website. You will see a screen similar to image below. This form can be used to make a payment with your credit card, similar to making any other online purchases.